Yesterday (June 21), Lily attended the opening ceremony of Lancome ‘Declaring Happiness‘ in Shanghai, China. She looked beautiful wearing Georges Chakra. HQ photos have been added to the gallery! Yesterday (Jun 9), Netflix hosted a premiere for Okja in New York! Lily wore a Valentino dress and Harry Winston jewelry. Check out the gallery for high quality photos from the premiere and after party! On Tuesday (June 7), Lily attended the Stella McCartney Resort 2018 Presentation in New York. You can check out HQ photos from the event in the gallery! Lily looked adorable! 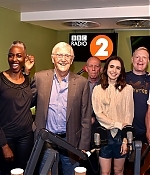 Lily made an appearance on the The Chris Evans Breakfast Show last week. I’ve added some photos of her appearance to the gallery! Yesterday, Lily attended the HFPA Party and Netflix Party at Cannes Film Festival. She looked beautiful! Check out HQ photos in our gallery. Yesterday (May 20), Lily attended the Vanity Fair And HBO Dinner celebrating the Cannes Film Festival. You can find HQ photos in the gallery.